We look at the winners and losers of Toronto's big transit makeover. Photo by Mike Geiger from the Torontoist Flickr Pool. If you just came back from vacation, you might be surprised to learn that Toronto’s transit plans suddenly look very different. Or maybe, given the amount of change the city’s best-and worst-laid transit plans undergo, you wouldn’t be surprised at all. With some maps and a look at the winners and losers of the new proposal, we catch you up on Toronto’s ever-shifting transit landscape. Just over a week ago, the Globe and Mail reported that city planning staff and Metrolinx have been working out the details of how to integrate Mayor John Tory’s SmartTrack with plans to expand GO Transit rail service, known as Express Regional Rail (RER). We learned that the preferred option is to have SmartTrack trains complement existing GO Transit Regional Express Rail (RER) services on the Kitchener and Stouffville corridors, but would only operate between Mount Dennis and Kennedy Stations. The controversial SmartTrack Eglinton West spur will be replaced by the “shovel-ready” Phase II of the Eglinton-Crosstown light rail transit line (ECLRT), which is already under construction east of Mount Dennis. The north-eastern section of SmartTrack, between Kennedy Station and Unionville Station in Markham, will be deferred, and part of a later Phase II. This eastern section, north of Kennedy Station, would have closely paralleled the proposed extension of the Bloor-Danforth Subway to McCowan Road, a project that Tory also backed. Last week, we learned about a parallel City Planning report [PDF] commissioned to examine these competing plans and develop a transit solution that would enhance Scarborough Centre’s status as an anchor growth hub and improve local transit access across the former city. The report recommends an eastern extension of the Eglinton-Crosstown LRT via Eglinton Avenue East, Kingston Road, and Morningside Avenue to University of Toronto–Scarborough Campus (UTSC), resurrecting most of the dormant Scarborough-Malvern LRT (although it does not reach Malvern). If built from Pearson Airport to UTSC, the Eglinton-Crosstown LRT would be over 40 kilometres long. It also recommends that the three-stop Scarborough Subway extension, which replaced a less-expensive LRT replacement for the ageing Scarborough RT line (SRT) during the Ford mayoralty, be scaled back to a one-stop extension to Scarborough Centre, skipping Lawrence Avenue and not continuing to Sheppard Avenue. The map above illustrates the recommendations of these two studies. If this is the new map going forward, there are some clear winners and losers. It also leaves a number of unanswered questions. Scarborough politicians. Brad Duguid, provincial minister for Economic Development and Liberal MPP for Scarborough Centre, was consulted on and rejected one plan, according to a report in the Toronto Star, before the current plan was made public. Councillor Glenn De Baeremaeker (Ward 38, Scarborough Centre), one of the most vocal proponents of the Scarborough Subway extension, spoke at Tory’s press conference, expressing his hopes that “the long civil war we have had on council will come to an end.” The combination of SmartTrack, the Crosstown LRT, the truncated Scarborough Subway extension, and the Sheppard East corridor delivers rapid transit to every one of Scarborough’s eight wards. University of Toronto Scarborough. With the partial revival of the Scarborough-Malvern LRT, it will be the new terminus of the Eglinton-Crosstown LRT. It likely helped negotiations that Brad Duguid’s brother, Brent, is Legal Counsel and Director of Partnerships at UTSC. Mount Dennis. The lower-income community, which feared a disruptive rail project to guide SmartTrack from the Weston Rail Corridor to Eglinton Avenue West and the Airport Corporate Centre, will become a major transit hub, with the Eglinton-Crosstown LRT operating in both directions, as well as SmartTrack, GO RER and likely a stop on the UP Express airport rail link. Mayor John Tory. SmartTrack is cut back, but the brand and concept remains intact. 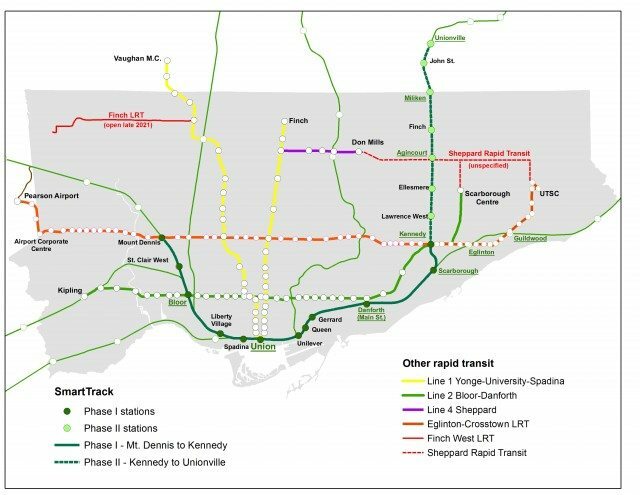 Tory also gets to deliver a paired-back Scarborough Subway with minimal resistance from pro-subway councillors, while acknowledging the proximity between SmartTrack and the subway extension. He still has to worry about the Ford brothers, who decided to make the revamped plan their latest cause célèbre. Centennial College. A station on the Scarborough LRT line would have been built adjacent to Centennial College’s main campus on Progress Avenue. Both plans for the Scarborough subway extension do not plan for rail transit to that institution. Malvern. Under the original Transit City Plan, the northeast part of Scarborough, Malvern, would have enjoyed three LRT lines terminating in that area: the Scarborough SRT replacement, the Sheppard East LRT, and the Scarborough-Malvern LRT. The Scarborough Subway extension would have had a stop at Sheppard Avenue and McCowan Road, at least reducing the time Malvern commuters would ride on buses to get to the subway. With the subway extension now planned to terminate at Scarborough Town Centre, and the Sheppard East LRT in limbo, there’s now nothing specifically planned for that corner of Toronto. The fate of the Sheppard East LRT. Construction on this forgotten transit project isn’t scheduled to start until 2021, essentially leaving it in limbo. On the Scarborough Transit Planning Update staff report, transit on Sheppard East is marked as “rapid transit to be determined” and is barely mentioned in the report. In the original Transit City plan, the Sheppard East LRT was scheduled to start first, and did: the Sheppard Avenue rail underpass at Agincourt GO Station; an empty median is where the LRT tracks are planned to go. Here’s a gap where Sheppard subway proponents, like Councillor Jim Karygiannis (Ward 39, Scarborough Agincourt) can push the most expensive option. Storage and Maintenance for “Crosstown East.” The Scarborough-Malvern LRT was planned to continue north of UTSC to Sheppard Avenue (and potentially further north along Morningside), connecting to the Sheppard East LRT. A maintenance and storage facility was planned for a site near Conlins Road and Sheppard Avenue that would have served the SRT replacement, the Sheppard East, and Malvern lines. With the withdrawal of plans for the LRT replacement of the SRT, the possibility of building a carhouse here is in question. Queen Street East, and Carlaw/Gerrard.) The elimination of a station on the Scarborough subway at Lawrence was predicated on funneling passengers to the SmartTrack line. SmartTrack frequencies and fares. With frequent, subway-like service, easy transfers and operation within the TTC fare structure, SmartTrack has the potential to attract respectable ridership, and help provide some relief to the Yonge Subway and Bloor-Yonge Station. But so far, details of what SmartTrack will look like have yet to be answered. 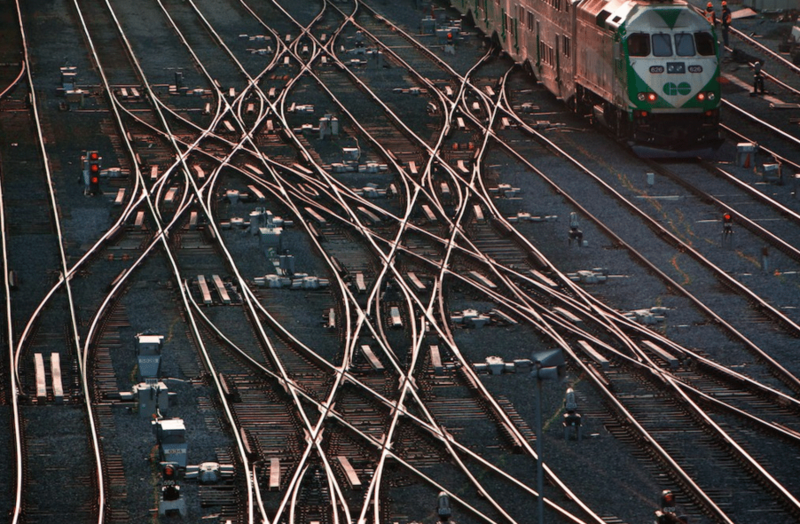 Without knowing exactly what SmartTrack will look like, it will be very difficult to make rational transit decisions. The role and timing of the Relief Line subway, which is also currently being studied by the Toronto Planning Department. There are many unanswered questions. The new plans are smarter, and cover more territory, than John Tory’s original “SmartTrack” proposal, but leaves Malvern and Centennial College out in the cold. Some of the conflicts between the separate studies, particularly the fate of SmartTrack north of Kennedy, must be solved.